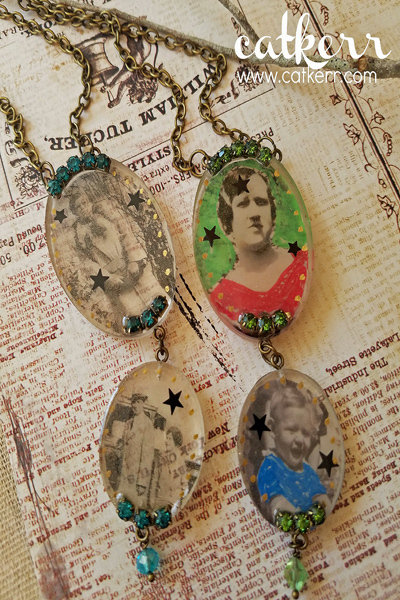 Project Description: Create unique and personalized jewelry with Computer Grafix and Resin! Easy to make and decorate! Print the images on Computer Grafix Film, allow time to dry and then cut them out to fit the mold. Add color to the images with Permapaque markers. Mix together two equal parts of Amazing Clear Cast and then add a base layer of resin into the mold and let cure for 24 hours. Remove backing from the images and place into the bezel. Use a Popsicle stick or Stylus to flatten the image. Mix up the second batch of resin and add some over top of the image. Before it cures completely add some confetti stars then let cure for 24 hours. Pop out pieces from the molds and mark where you want to drill your holes. (If you do not want to drill a hole you can glue on a bail to the back of the pendants). Then drill tiny holes and screw on the tiny eye hooks. Add metallic pen dots around the pendant. Mix up a final batch of Resin and using a Popsicle stick, add resin to the pendant. Before it cures add rhinestone strands to the resin. Let cure for 24 hours. Assemble your necklace by adding jump rings, chain and beads if desired.